I just saw “Big Eyes” and found out this is not the movie with the Big Bad Wolf. Although, there is a psychopathic husband who will burn your house down. Margaret (Amy Adams from “American Hustle”) has one good child from one bad marriage when she rolls into San Francisco in 1955. She works odd jobs and tries to sell her paintings on the street. There she meets Walter Keane (Christoph Waltz from “The Zero Theorem”), who sells real estate and peddles Paris street scene paintings. Soon the two are married so that Margaret can prove she has a stable home for her daughter. Eventually Margaret gets tired of Walter and his lies and leaves him. As she says, “All art is personal,” and the person who creates art must be recognized. This true life story of Margaret Keane’s quest to tell the truth and prove she was that artist behind the Keane paintings played out in Federal Court. I found Adams to be sweet and sensitive and artistic in her portrayal of someone who was used and abused by the man she loved and trusted. Waltz’s own maniacal manner also seemed picture perfect. I did get the feeling that director Tim Burton (“Dark Shadows”) fell in love with the artist as much as the art and left more of his signature stylings at home, so he did not get in the way of the story. This movie was a little like the fictional film noir “Scarlet Street” (1945 by Fritz Lang), which is really worth seeing for some great twists and turns. 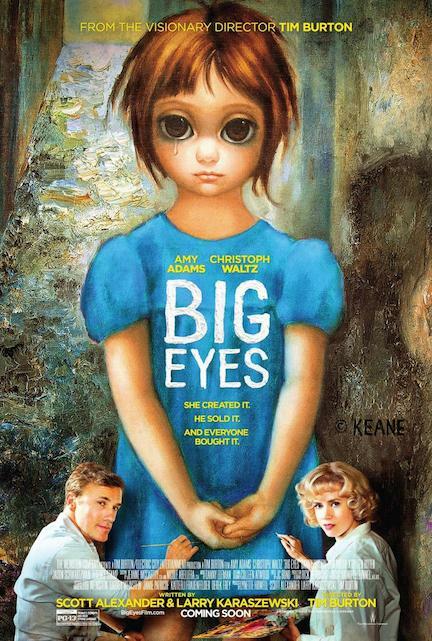 While “Big Eyes” was restrained by the facts, the story was well told and well played. For that I will give it 3 ½ stars out of 5. It may not be a masterpiece, but it is worth your big eyes taking a look.